← Wait – I gained *HOW MUCH* this week?!?! So I was at the grocery store yesterday, picking up some stuff for dinner with my in-laws tonight. I decided to pick up some cod (it was on sale), when I caught a glimpse of some pistachio encrusted Salmon for sale. 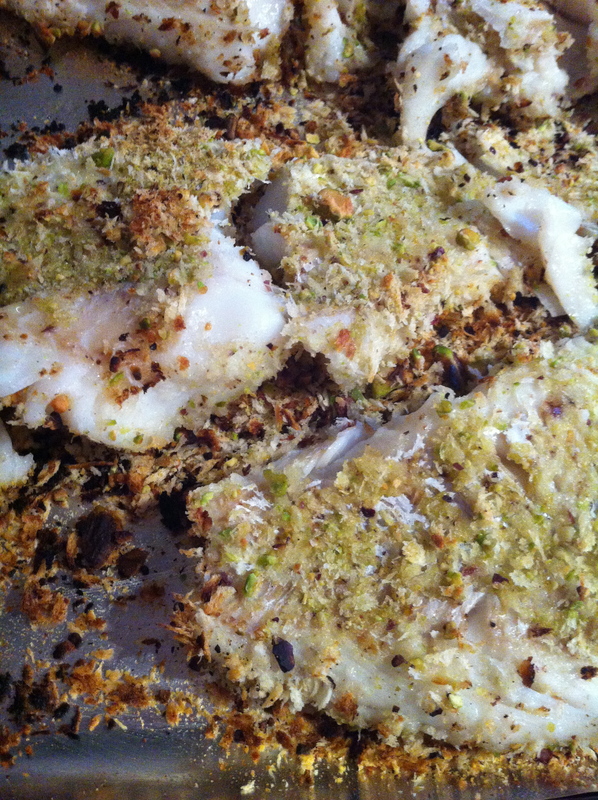 I asked my fish guy if I could coat the cod with the pistachios or if the nuts’d overwhelm the subtleness of the fish. “I could do that,” I replied. 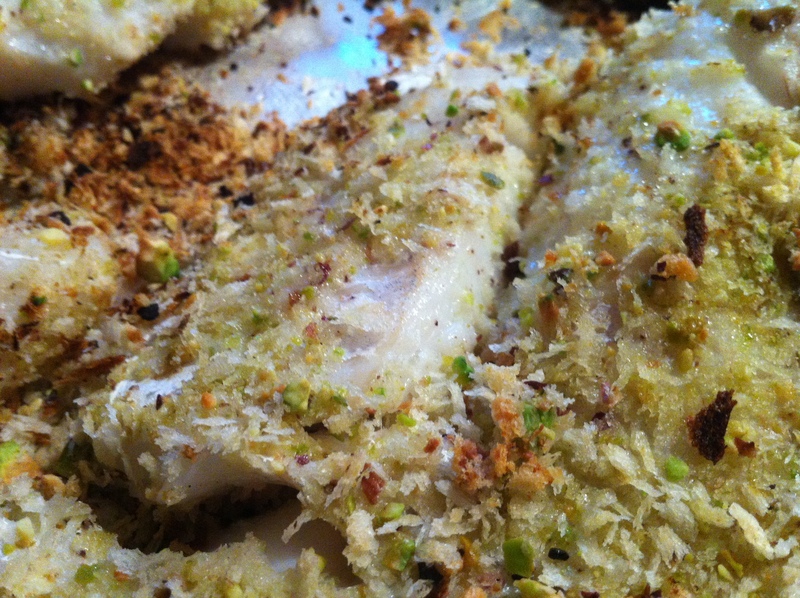 For dinner tonight I have 2 large and 1 small fillets of cod (feeding 4 adults and 2 toddlers) that I encrusted with a mix of 1 cup shelled pistachios (I chopped them up in the mini chopper thingie) and 1 cup of panko breadcrumbs. 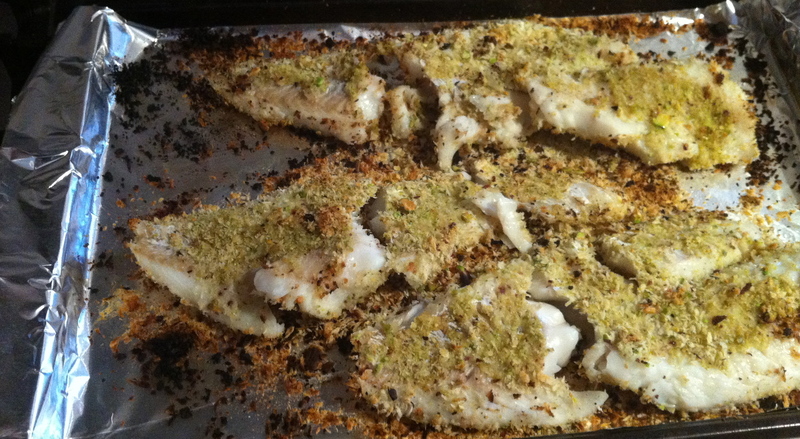 I dried off the fish, laid them out on foil, shpritzed them with some cooking spray and pressed the panko/nut mix on. Knowing I’ll need to flip the fish halfway through, I coated both sides with the nuts/breading. I served the fish with a green salad and the lentils I made a few days back. End Result? DEVOURED, though C and I thought it needed a touch of salt. C suggested that next time (and there WILL be a next time) I should sprinkle a little grated parmesan over the top after I flipped the fish. Toddler Review: R ate it by the handful – until she realized we were paying attention to her, and little J had THIRDS. “More Please” he kept saying! 1- Dry your fish and lay out on foil. Turn your broiler on. 2- Mix the nuts and breadcrumbs together in a bowl. 3- Shpritz with the Pam/Cooking Spray and spoon the nut-crumb mix over the top. Press in with your fingers and gently flip the fish over. Shpritz and crumb side 2. **Though, now that I think about it… you can totally wait to top side two until you flip it while it’s cooking. *shrugging shoulders* Maybe I’ll remember to do that next time. 4- Whack the pan under the broiler for 10-15 minutes, flipping halfway through. After the flip, if you’re using cheese, sprinkle it on now!